The consumption of Japanese anime and manga among Malaysian readers has increased in the past decade (Roslina Mamat, Yamato Eriko, Sanimah Hussin, & Farah Tajuddin, 2012). 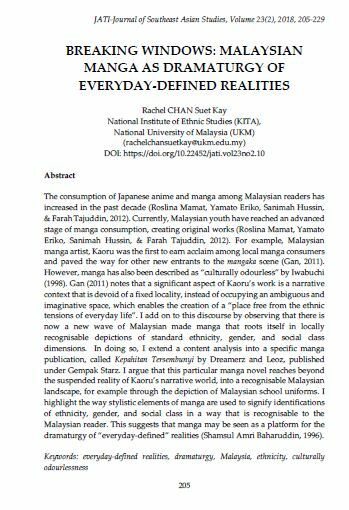 Currently, Malaysian youth have reached an advanced stage of manga consumption, creating original works (Roslina Mamat, Yamato Eriko, Sanimah Hussin, & Farah Tajuddin, 2012). For example, Malaysian manga artist, Kaoru was the first to earn acclaim among local manga consumers and paved the way for other new entrants to the mangaka scene (Gan, 2011). However, manga has also been described as “culturally odorless” by Iwabuchi (1998). Gan (2011) notes that a significant aspect of Kaoru’s work is a narrative context that is devoid of a fixed locality, instead occupying an ambiguous and imaginative space, which enables the creation of a “place free from the ethnic tensions of everyday life”. I add on to this discourse by observing that there is now a new wave of Malaysian made manga that roots itself in locally recognisable depictions of standard ethnicity, gender, and social class dimensions. In doing so, I extend a content analysis into a specific manga publication, called “Kepahitan Tersembunyi” by Leoz, published under Gempak Starz. I argue that this particular manga novel reaches beyond the suspended reality of Kaoru’s narrative world, into a recognisable Malaysian landscape, for example through the depiction of Malaysian school uniforms. I highlight the way stylistic elements of manga are used to signify identifications of ethnicity, gender, and social class in a way that is recognisable to the Malaysian reader. This suggests that manga may be seen as a platform for the dramaturgy of “everyday-defined” realities (Shamsul Amri Baharuddin, 1996). CHAN SUET KAY, Rachel. BREAKING WINDOWS: MALAYSIAN MANGA AS DRAMATURGY OF EVERYDAY-DEFINED REALITIES. JATI - JOURNAL OF SOUTHEAST ASIAN STUDIES, [S.l. ], v. 23, n. 2, p. 205-229, dec. 2018. ISSN 2600-8653. Available at: <https://jati.um.edu.my/article/view/15419>. Date accessed: 26 apr. 2019. doi: https://doi.org/10.22452/jati.vol23no2.10.